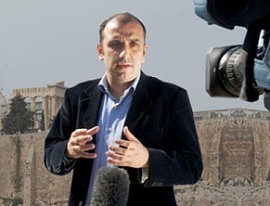 Greece: Digicam offers live broadcast studio and camera crews in Athens. Athens, February 2018: New to promoting its services on TVZ, Digicam has been supplying broadcast services for more than 20 years. It carries one of the largest ranges of broadcast video equipment in Greece and can provide clients with a complete range of services including experienced and creative camera crews, technical project management and HD/SD broadcast equipment and IP SNG units. Digicam says it has 20 full-time crew staff and more than 40 freelance crew contacts to provide a 24/7 service. It has live broadcast studio facilities in central Athens and can also provide live stand-up positions, tape playouts with SD and HD availability direct to Eutelsat W2A and to the EBU Network as well as full IP connectivity to the new KA-SAT on 9E. For more information, please see Digicam's profile on TVZ.